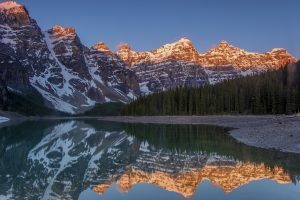 At Canadian Photo Adventures, our adventure tours are led by professional travel photographers who can help you master your photography skills. Whatever photo adventure you choose, you are bound to learn something new about photography. In this blog, we will go over a few tips for composing great nature shots. A powerful way to compose your photos in a visually interesting way is to draw the viewer into the scene using leading elements. Some leading elements you could use include curves, lines, and shapes. Lines that go from the foreground to the background of the image are particularly good at leading the eye into the scene. In the image to the left, the curves and repeated shapes of the mountains and trees draw the viewer’s eye int o the images. You can add depth and beauty to your photograph by using a foreground for contrast. The foreground provides a reference point that simplifies scenes that have a lot going on. For example, the image to the right includes some of the curving shoreline to add contrast to the vivid color of the water and improve the composition of the image. Use visual elements to draw attention to the subject of your photo. One way you can do this is with framing. You can frame your image with more literal frames, such as tree branches or windows, or you can use a combination of elements around your subject. You can also use light as a way to draw the viewer’s eye to your subject. Create a spotlight effect with brightness behind your subject. 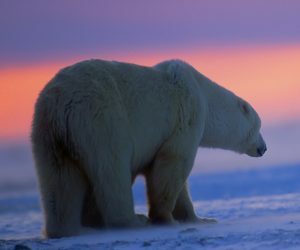 The image to the left uses the light from the sunrise to emphasize the polar bear. These tips will get you started towards composing great nature photos; however, the best way to learn photography is to come on one of our adventure tours! 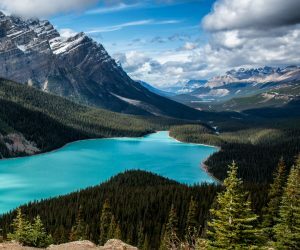 We offer trips to two of the most beautiful national parks in Canada. To reserve your spot on our next adventure tour, contact us!